January 21, 2018 Michal B. Getting a taxi in Prague is really easy, as there are many of them and most of the local drivers speak or understand basic English. However, some of them may try to rip you off with crazy rates, especially if you hail a cab on the street. In fact, there has been a whole video series about taxi drivers in Prague. But we have some great tips for you on how to get a good, safe, and cheap taxi ride in Prague. OUR TIP #1 If you are taking a taxi in the street, always agree on the final price first before getting in. Some drivers may even trick the meters. OUR TIP #2 In case of any trouble with the taxi driver (e.g. if you think you are paying way too much) call the emergency number 112 and explain your situation to the operator. OUR TIP #3 Always be aware that the maximum rate per kilometer is limited by the city of Prague to 28 CZK ($1.10) per kilometer, and the entry rate to 40 CZK ($1.50) for one ride. So, for example, the 17-kilometer taxi ride from Vaclav Havel Airport to downtown (Wenceslas Square) will cost around 450 CZK ($18.00). 3. Calculator – How Much Will I Pay for my Route? 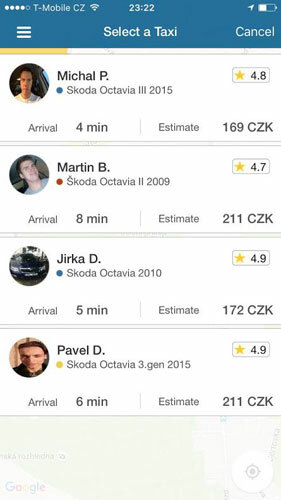 Using our calculator below you can easily estimate how much you will pay for your ride in Prague. 4. Tipping – Should I Give a Tip to the Taxi Driver? Tipping the driver really depends on how you feel. If the ride was smooth and the driver nice, then why not? The typical tip rate is 10% on top of the total cost. On the other hand, if you didn’t like the ride for any reason, don’t give a tip. It’s totally optional. 5. Credit Card – Can I Pay with my Visa or MasterCard? In general, yes, most of the taxis nowadays have payment terminals accepting international credit/debit cards, especially the taxis you will find at the airport or train stations. But, just to be sure, we recommend using one of the apps below. That’s right, Uber works perfectly in Prague and it’s the by far cheapest taxi option. It costs only 9.90 CZK ($0.40) per kilometer and 3.00 CZK per minute for UberPOP and 27 CZK ($1.00) per kilometer for UberBLACK. The only disadvantage of using Uber in Prague is the low number of drivers, so sometimes you can’t book the ride due to limited availability. 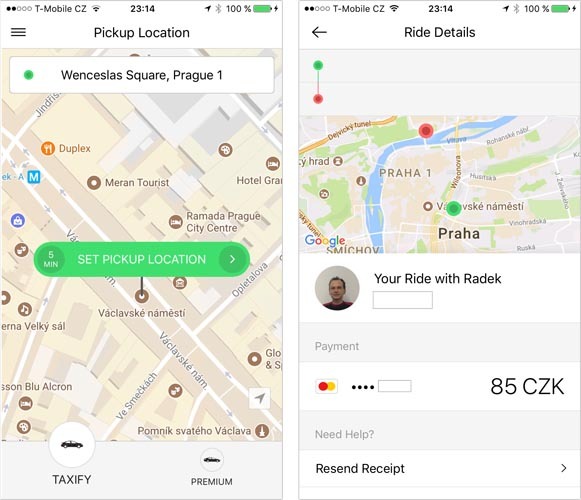 Read more about Uber in Prague. Taxify is an international company based in Estonia and very similar to Uber. 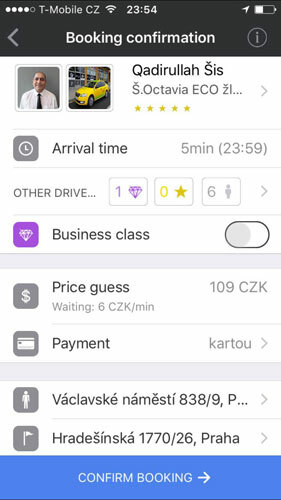 They offer great rates which are even cheaper than Uber in Prague – 8.90 CZK ($0.40) per kilometer plus 3.50 CZK ($0.16) per minute. The easiest way to order a Taxify is by using their mobile app, which also supports credit/debit card payments. You can also pay with cash (Czech Crowns only) to the driver. If for some reason you don’t want to use Uber, Taxify is a perfect alternative. 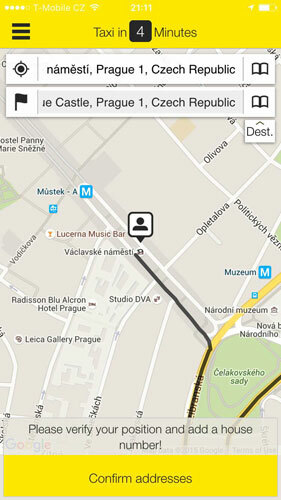 Get the app using this link and you will get also 150 CZK off from your first ride. Or enter promo code “TOMASJ97” if you already have the app installed. Liftago is something like a Czech Uber, but the price is set by each driver. So you simply enter locations for pick-up and destination, and then you can select from a list of drivers based on price and rating. Generally, the prices vary from 18 CZK ($0.70) per kilometer up to 28 CZK ($1.10) per kilometer, but you always view the price upfront. The Liftago app is also fully compatible with your Credit Card or Debit Card, so you don’t need any cash at all. Modry Andel is a solid Prague-based taxi company. They mostly use new Skoda Superb or Skoda Octavia cars, so the ride is pretty smooth and safe. Using their app you can book a cab to your location and also set up the destination. The price per kilometer is pretty good – 21 CZK ($0.80) and only 19 CZK ($0.75) during the night. The entry fee for each ride is the standard 40 CZK ($1.50). Alternatively, you can select a business class which costs 28 CZK ($1.10) per kilometer and guarantees a Skoda Superb with a uniformed driver. Unfortunately, you can’t enter your Credit/Debit Card into the app directly, but you can specify that you want the car with a payment terminal. Please note that this isn’t properly localized in the app, so in the ‘Payment’ section you need to select the ‘Kartou’ option (means ‘by card’). Modry Andel offers reliable drivers and new cars for a decent price. The only downside is that compared to Liftago and Uber the app is a little harder to navigate and doesn’t offer payment integration. Taxi Praha (sometimes called Nejlevnejsi Taxi which means Cheapest Taxi) is another solid taxi company based in Prague, and they mostly use the brand new Skoda Octavias. Their app is pretty smooth and easy to use, as it is fully localized to English and you can set pickup and destination locations using the GPS signal. Taxi Praha is trying to be the cheapest company on the market. Their rates are very low – 18 CZK ($0.70) per kilometer and 27 CZK ($1.05) entry fee for each ride. You can’t pay for the app but all their vehicles contain payment terminals for your Visa or MasterCard. Welcome Pickups – Company focusing strictly on the airport pickups. For the same price as a taxi, you will get a private driver with excellent English and knowledge of Prague. The driver will be also waiting for you with the welcome sign at the terminal exit. Tick Tack Taxi – Well established company with luxurious cars (Audi A6) in white color and professional drivers in suites. They are charging a maximum rate of 28 CZK ($1.10) per kilometer and a 40 CZK ($1.50) entry fee, but it is very well deserved. Tick Tack has also convenient mobile app (Uber style) or you can simply call 14 222 or +420 721 300 300. AAA Taxi Prague – This company occupies the airport, so you can see their yellow cars right in front of terminal 1. They are OK, but a bit expensive, with the highest possible rate of 28 CZK ($1.10) per kilometer and a 40 CZK ($1.50) entry fee. For direct booking via phone, call +420 222 333 222. City TAXI – This company can be found at the main railway stations. They are reasonably priced, with rates starting at 24 CZK ($0.90) per kilometer and a 40 CZK ($1.50) entry fee. Also, you can get a Mercedes-Benz E-Class with a professional driver for 28 CZK ($1.10) per kilometer. For direct booking via phone, call +420 257 257 257. 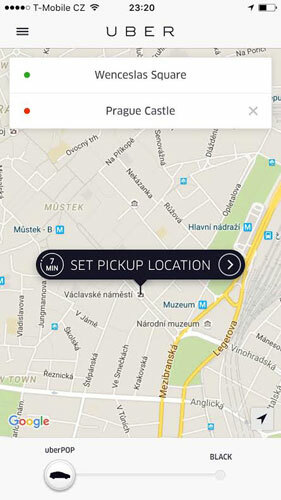 Lyft – Unfortunately, Lyft isn’t available in Prague or any other city in Europe. You have to go with Uber instead. To get a better idea of how the taxi situation in Prague, watch the following episode from Honest Guide. Always remember, do not take any suspicious taxi from the street and if you really need to, agree on the price first. Wondering if there are options for groups of 5. With most cars seating only 5 my family don’t fit in standard ubers, are there 7 seater cars available? Is there an extra cost for this? Thanks! 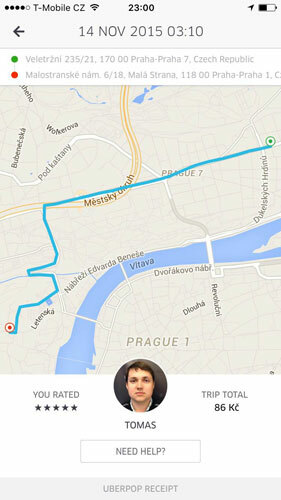 Tonight I got quoted 7000 to travel from railway station to Charles Bridge – cash. No meter. Did my calculations and realized very expensive so declined. Was then asked what I wanted to pay and then offered ride for 5000. Decided to catch public transport for 24 each person with a small walk. And yes it was a yellow taxi waiting at the railway station. No other companies in sight. This production mirrored my experience. And your Liftago link https://www.liftago.com/invite/TOMAS5628 does not work – page not found. Please update the page with new promos/links. Taxify is valid only for the first ride and Liftago seems to be having issue on their side with page, but you should be still able to add the code manually within the app.